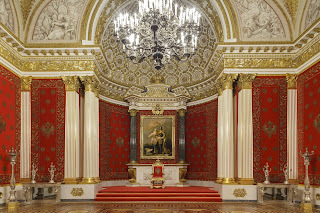 The Small Throne Room in the Winter Palace, with its famous portrait of Peter the Great and Minerva by Jacopo Amigoni, was restored by Vasily Stasov in 1840. 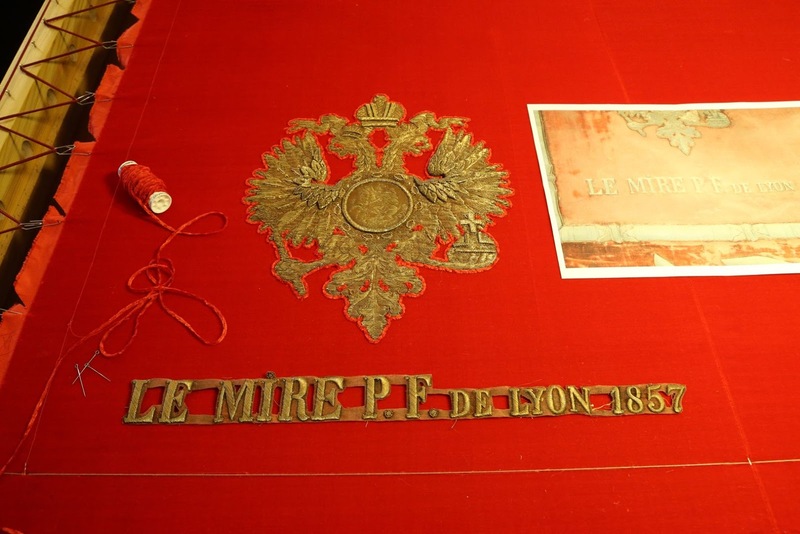 In 1856 with the redesign of the State Arms, new crimson velvet panels were ordered from the Lyon firm Le Mire Pere & Fils. 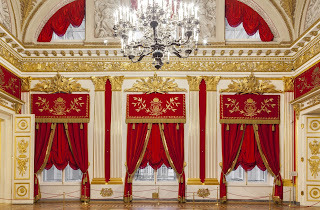 In 1859, Court Officials completed an inventory of the rooms of the Winter Palace. Three fascinating mysteries are revealed in the Small Throne Room inventory. 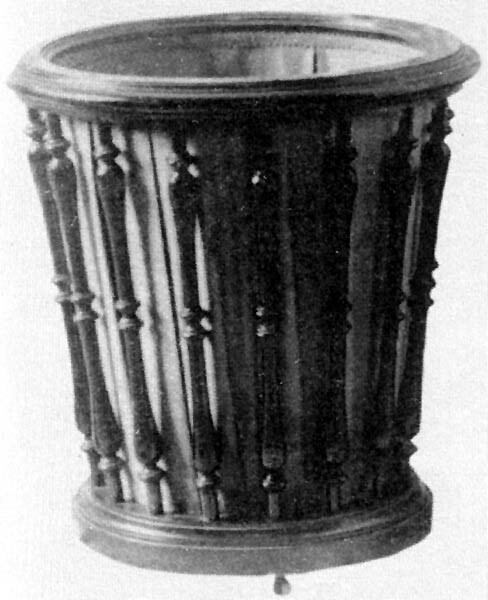 There were two mahogany waste baskets with metal fittings listed in the inventory. It’s baffling as I have never read previously of waste baskets placed in the State rooms. They are not visible in any of the watercolors or photographs. 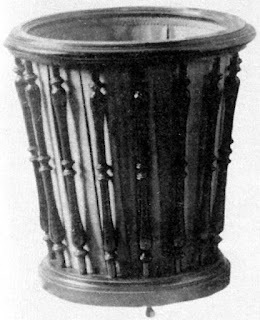 Why were waste baskets, a convenient receptacle in the private apartments, needed in a State room used for grand ceremonies? Kleenex had not yet been invented! There was also an indoor thermometer in a bronze frame listed in the 1859 inventory. 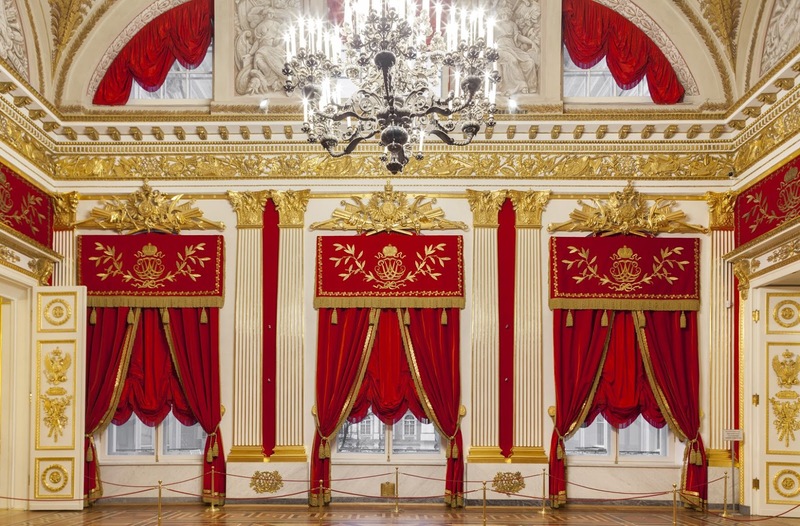 Did all the State rooms have a thermometer? Where was it located? It too is invisible in watercolors and photographs, although until confirmed, I may have identified it by the door to the Fieldmarshals Hall. Questions I continue to research! 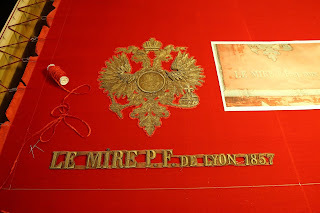 Another intriguing mystery is the embroidered signature of the manufacture: Le Mire P.F. de lyon 1857. It is prominently displayed on the second velvet crimson panel to the right. 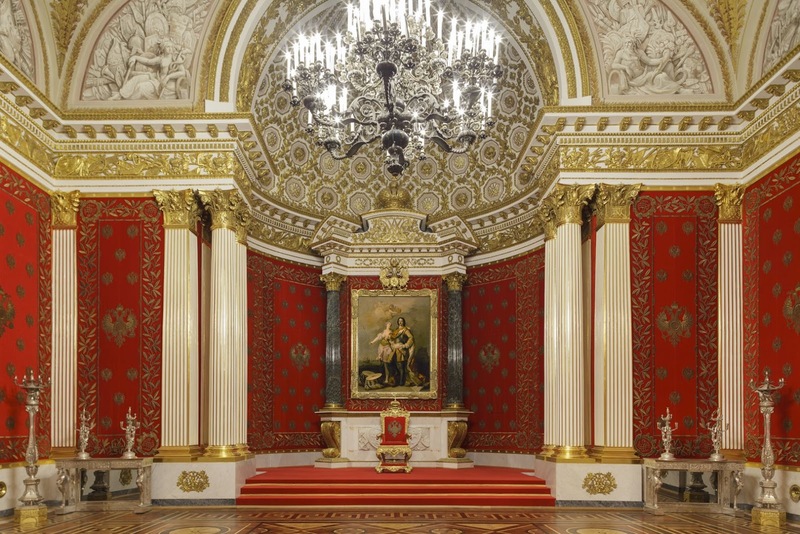 Why did Alexander II and the Minister of the Court permit a textile firm to advertise in the Small Throne Room of the Winter Palace? It is unknown and impossible to understand until relevant documents surface. Could they have been for wine, and not waste baskets? Thank you very much for the idea! The inventory lists it as baskets for papers but I used the more familiar English term waste basket. The room is small, more of a thru hall between the Fieldmarshals Hall and Armorial Hall where tables were laid. I will check my research on Imperial balls and tables, etc to see if I can tie in more information with the Small Throne Room. Probably not - the opening is too big (if you have seen old western movie saloons). The Russian translation is 'basket for papers' s it may just have been used for any paper waste for example menus, dance cards or invitations that someone may have had in their hands and did not want to carry anymore - just an opinion.